Hops: Fuggle, Cascade, Centennial, Chinook. This is a Pale Ale to be reckoned with. 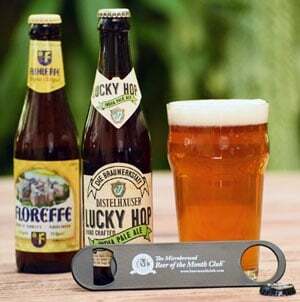 Winner of the Gold Medal at the 2004 World Beer Cup and 2003 World Beer Championships as well as silver medals at both the 2003 Great American Beer Festival and the 2002 World Beer Championships. Immediately note the big Cascade hop nose—characteristically floral, almost perfumy, with citrus scents, a result of the extensive dry hopping with Cascade, Centennial and Chinook hops. The flavor presents notes of floral and somewhat spicy hop flavors. Note the perfect balance between perfumy floral flavors and the countering bitterness. Also expect a solid malt and grain backbone. Great with steak and burgers from the grill. It’s finally Spring—time to thaw out the grill! We bid you a friendly reminder to stock up now for that much anticipated barbecue and what better way than by visiting www.winemonthclub.com and www.cheesemonthclub.com. And make sure you don’t forget to crown those patio tables with your beautiful flowers from the Fresh Cut Flower of the Month Club (www.flowermonthclub.com). Happy Spring! As a member of a well-known family of Santa Barbara County California winemakers, Adam Firestone stood out a bit. When gathering for family dinners, he’d be the only one who had a bottle of beer at the table. When his sister Polly married David Walker, a fellow beer lover with a keen awareness of British beer styles, the brothers-in-law started talking about getting a microbrewery founded. 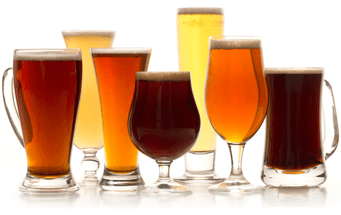 Their venture into beer brewing was spurred on by their area’s shortage of grapes in 1995. They used what winery supplies they had available to brew their first batch, which was made in old Chardonnay barrels. Sadly, the residue from the wine contaminated their first batch, but after switching to new American Oak barrels in a closed system based on the old British brewing method called the Burton Union system (which is rarely used today), the Firestone Union oak barrel brewing system was born… Instead of using stainless steel tanks, Firestone Walker uses individual 60-gallon oak wine barrels for fermentation and conditioning. The improved palate, hop maturity, unique flavors and aromas imparted by the oak barrels all add up to beers of intriguing complexity. This unique process, which links winemaking and beer brewing techniques, makes them the only American Brewery that selectively ferments its ales in oak barrels. Here are a few of their very impressive brewery accolades and distinctions (in addition to the medals won by their fine beers—some of which are listed in the beer reviews below). Both the brewery and their head brewer Matt Brynildson were named “World Beer Cup Champion Brewery and Brewmaster” for the category of Mid-Size Brewing Company (which spans all breweries with an annual production between 15,000 and 2 million barrels) at the 2004 World Beer Cup. The award follows a similar distinction at the 2004 Great American Beer Festival at which Firestone Walker B.C. was named “Mid-Size Brewing Company of The Year” while Brynildson was named “Mid-Size Brewing Company Brewmaster of The Year.” These days, Adam’s younger brother Andrew Firestone has joined the family team in the capacity of Sales Manager. Andrew combines a similar passion for fine beer with broad experience in institutional finance, adding a new dimension to Firestone Walker Fine Ales. Some of you might recognize his name for another reason besides the well known surname of ‘Firestone’. Andrew was the star of ABC’s popular Reality TV show “The Bachelor” (season 3). For more information about the brewery or scheduled tours, call (805) 238-2556, or visit their website at www.firestonebeer.com.